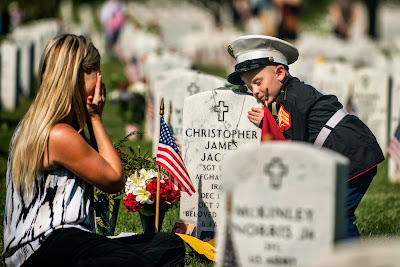 The above Defense Department photo shows Brittany, left, and her son, Christian, 4, visit the grave of her husband and his father, U.S. Marine Corps Sgt. Christopher Jacobs, on Memorial Day in Section 60 at Arlington National Cemetery in Arlington, Va., May 25, 2015. Christian is wearing his father's cover.